Also called apricot kernel oil, apricot oil is a thin, odorless oil pressed from the seed or kernel of the apricot--Prunus armeniaca. Commonly used in the world of massage, apricot oil is a versatile oil that possesses multiple benefits, depending upon how you choose to use it. Typically produced in large quantities, apricot oil is readily available at natural health stores and pharmacies both in-store and online. Prices vary, depending upon factors such as how the oil is extracted from the apricot kernel and whether it's food grade or not. If you have a personal or family history of nut allergies, apricot oil provides a texture and color similar to that of the comparably priced sweet almond oil without its propensity for producing allergic reactions. As a rule, apricot seed oil tends to have a longer shelf life than other commonly used oils. According to Margaret Wittenberg, author of "New Good Food," apricot kernel oil provides an all-purpose oil appropriate for all types of cooking. 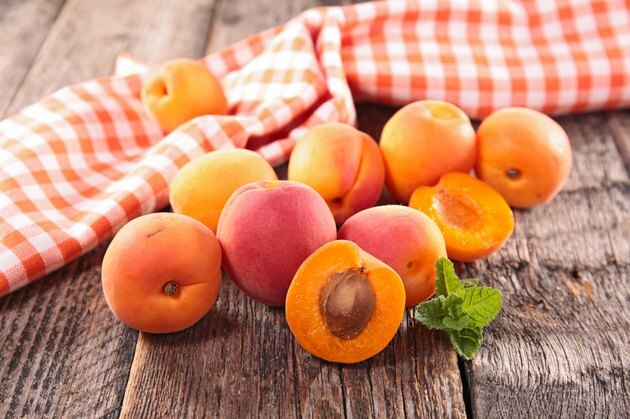 Rich in monounsaturated fat, food-grade apricot oil may help lower LDL or "bad" cholesterol and promote cardiovascular health, especially when used in recipes in place of shortening, butter and other sources of saturated fat. Paula Begoun, author of "The Complete Beauty Bible," notes that apricot oil is one of the oils that has a lipid content similar to that of your skin. When the skin's lipid content becomes too low, dry and irritated skin results; topical application of apricot oil helps soothe and heal this rough, damaged skin. The oil's fine texture allows more rapid skin penetration, which promotes more prompt healing and nourishment of sore or chapped skin without residue. Shirley Price, coauthor of "Aromatherapy for Health Professionals," notes that apricot oil is also beneficial in relieving the itch and irritation of eczema-ridden skin. As an added benefit, Price points out that apricot oil helps prevent and minimize the appearance of wrinkles. According to Phyllis Balch, certified nutritional consultant and author of the book "Prescription for Nutritional Healing," apricot oil provides a prime option for use as a carrier oil in aromatherapy. When using apricot oil topically, you can blend it with multiple different essential oils, including lavender, chamomile, rose, lilac, jasmine and ylang-ylang to create a pleasing yet mild massage oil. Balch recommends 25 drops of essential oil per 2 oz. of apricot oil for use in massages for adults. What Are the Benefits of an Almond Oil Massage?